Posted by jkahane in canada, history, in memorium, the world. Today is the 100th anniversary since the Battle of Vimy Ridge. This battle is one of the most famous of the First World War, and is of special significance to Canadians. As the 100th anniversary since the battle, the ceremonies to be held in Canada as well as at the Vimy Monument in France will be unique today. Here’s honouring the Canadian soldiers who died at Vimy Ridge on this day (and the days surrounding it) back on April 9th (to the 12th), 1917.
in 9 to 12 April 1917. They served their country well, and paid the ultimate price. It is only fair, right that we acknowledge them today on this anniversary. Posted by jkahane in house, life, personal, the world, weather. It’s the last day of 2016. Thank Goddess this year is coming to an end. Sure, there have been some good moments in time this past year, but 2016 saw too many deaths of beloved figures in both music and entertainment, a change in U.S. politics whose ramifications will be felt most strongly in 2017, and the senseless slaughter of too many people world-wide in acts of terrorism and sheer evil. Add to that the rough times I’ve had this year health-wise and in other regards that I’ve not discussed this year, and… Well, to reiterate, good riddance to 2016. It’s a Saturday morning, so I’m sitting here at home taking it relatively easy. The weather outside is cold, and the snow is coming down (there’s supposed to be another 15-20 centimeters of the white stuff today and tonight), and I feel as if I’ve not really slept all that well last night. I don’t intend to do a lot of stuff today, and I’ll see how I feel later in the day. Time to clean the dishes, and take a nice, hot shower. Hopefully the latter will make me feel somewhat better. Posted by jkahane in life, personal, the world. 1 But we don’t need to be worried about climate and environmental change! Right!!! Posted by jkahane in news, the world. Just a reminder to folks. Today is International Human Rights Day. This seems like a good day for a donation to your favourite or preferred organisations waging these advocacy battles around the globe. Oh, and if you’ve got some suggestions for organisations worthy of support, please leave a note in the Comments section about this. Posted by jkahane in personal, terrorism, the world, tragedy. Fifteen years ago today, a terrible series of events occurred. We call it 9/11. Once more, it occurred to me today that I was at the sf bookstore I owned and ran back in those days, Basilisk Dreams Books, getting paperwork done for the morning and getting ready to open the door, when the kind lady who owned the store next door (a video store that also sold tvs, vcrs, and dvd players) knocked on the door, and said that I needed to come to her store and see the terrible tragedy that had occurred and was still ongoing. Needless to say, the complexion of the rest of that day was forever changed. And the world changed that day forever as well. I want to once more offer my condolences to those who lost loved ones on that day, and my heartfelt thanks for those who toiled and struggled and bravely survived that day. On this day, take the time to remember where you were on 9/11. And how your life was affected by the terrible, tragic events of that day. Posted by jkahane in life, news, the world. I am terribly saddened and shocked to hear about the earthquake in Italy that has devastated the mountainous central area. While I don’t have family in Italy (at least none that I know of), the terrible pictures and images from the locations worst hit have been gut wrenching to see in the various media. 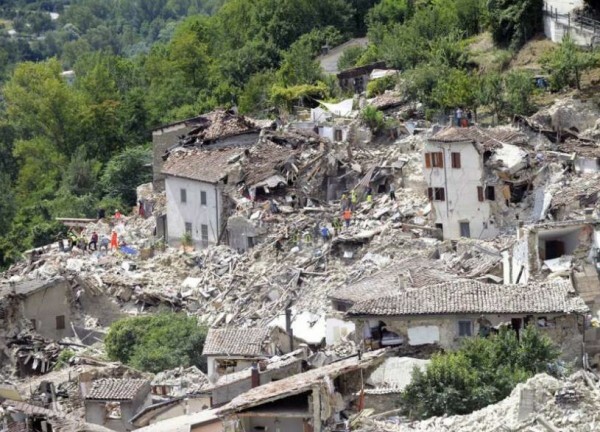 While most of the focus has been on Amatrice, other locations such as Accumoli and Pescara del Tronto, have also been levelled by the earthquake. My condolences to all the people and families affected by this natural disaster.